Unfortunately, most pet owners are not aware of this growing problem. Your veterinarian can help you distinguish whether or not your pet is at his or her ideal body weight. If it is determined that you pet is overweight, your veterinarian can discuss an appropriate diet for your pet, including the type and amount of food and the frequency of feedings. He or she can also help tailor an appropriate exercise plan for your individual pet, taking into account any medical conditions, breed, and age. All pet owners should strive to maintain an ideal body weight for their pet. 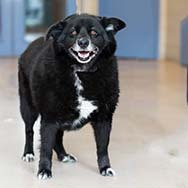 Obese dogs and cats are more likely to suffer from osteoarthritis, type 2 diabetes, high blood pressure, heart and respiratory disease, amongst many other issues. Most concerning is that being overweight can greatly decrease an animal’s life expectancy. By working with your veterinarian, you can help your pets stay at a healthy weight and can help ensure that they lead a long and healthy life.